The young US airman had been studying the martial arts for several months when his sabum announced to the class that they would be performing a demonstration at the public square. A large crowd of people stood and watched in the small Korean village as the first event commenced. The master spoke briefly to the villagers about the art of tang soo do before he called upon his first charge. The nineteen-year-old airman felt honored to hear his name announced to demonstrate his ability to break a stack of roofing tiles with his bare hand. He stood up nervously and walked over to the small platform where the tiles were placed. His heart was now racing with anticipation as a hush came over the crowd. He visualized annihilating those formidable looking tiles that seemed to be stacked a mile high. He knew he had to nail this on the first try - there would be no second chance. This was it. He raised his hand, and with all the ki energy he could muster he fired his fist down with incredible speed. The tiles didn't budge. Chuck Norris had just broken four knuckles in his right hand. 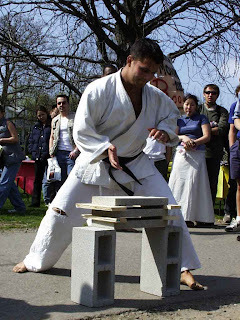 Breaking has always been a crowd pleaser at martial-art demonstrations. No karate or TKD demo is really complete without the obligatory sidekick or shuto (knife-hand) busting apart some inanimate material. Planks of wood (white pine is a favorite) and even slabs of ice have been the objects of choice at many demos. Even the Karate Kid had his turn at the frozen stuff. For the less inclined would-be breaker, the convenience of using Breakaway boards - plastic molded panels that have interlocking seams that allow them to be reused - offer all the glory of mayhem without having to end up in the X-ray room. The ones that I've seen use a color-coding scheme; yellow being the least resistant, on up to black for the heavy hitters. Still, don't try this at home. Mr. Miyagi's tactic of shearing the tops off of three beer bottles at once to fend off bullies was a neat trick. Kyokushin karate founder Mas Oyama routinely performed this stunt at demos with just one bottle. When one of his students attempted the same feat he almost lost his little finger. Oyama's other infamous knack for using a shuto to chop off a bull's horns would have undoubtedly invoked the wrath of animal rights activists today. I think pitting Oyama against a group of unruly protesters would've been much more fun to watch. Some schools use board breaking as a requirement for belt promotion, the idea being that a good break should be equated with causing great injury to your opponent. Otherwise, yourself. Just ask Chuck Norris. Except for the speed breaks, which really are tough to do, I've never been all that impressed with most breaking demos, for the simple reason that I could probably teach me sainted old Irish mother how to break a 1-inch board with a shuto in less than ten minutes. Granted, adding more boards makes a tougher, more impressive break, but I hardly ever see anyone do that. I'm always a lot more impressed with a sharp demonstration of precise technique on a moving human being. Who knew he'd become world champion! We break boards at two tests (green & brown), mainly to check that we're applying adequate power in basic techniques. The TKD dojo we sublet from does breaks non-stop, but it really doesn't seem to do much that I can see - other than give them good demo moves. We don't break anything in my dojo. Have you seen the guy on TV who breaks slabs of concrete with his head? They measured the force of his hit and it was like getting hit with a freight train or something. Interesting, but my head's not signing up anytime soon. Welcome to my site, Dan. I agree. I think it was Bruce Lee's character in Enter The Dragon that said that boards can't hit back. He had a point. After Norris broke his hand on that fateful day he said he must've chopped up a thousand boards since. Maybe he did use those paper thin boards! One thing I really like about Norris' accounts of his life - especially his early years in the martial arts - is that he always includes the mishaps and screw-ups he made to make a point. The point being that not only did he continue striving, but that he never made the same mistake twice. The TKD dojo we sublet from does breaks non-stop, but it really doesn't seem to do much that I can see - other than give them good demo moves. TKD people seem to own breaking - and demos with their spectacular brand of leaping kicks. Maybe not too practical, but they know how to put on a show. Nothing wrong with that - it draws people in and this could be one of the reasons TKD became an Olympic event. Don't forget that one way Shimabuku enticed US marines into taking up Isshinryu was by displaying his ability to drive spikes through boards with a palm heel. Have you seen the guy on TV who breaks slabs of concrete with his head? They measured the force of his hit and it was like getting hit with a freight train or something. Well isn't that special. I wonder if he does kids' parties. Have you ever noticed that it's usually a Westerner performing these wacky stunts? They must be laughing at stuff like this on the other side of the pond! Some of those required kicks sound tougher than the breaks you mention! I have a bad knee too. Going up is one thing - landing is another for me. Thanks for sharing all your experience and info on the re-breakable boards, I was hoping you'd stop by. "The point being that not only did he continue striving, but that he never made the same mistake twice. " Good lesson indeed. That guy is a living tribute to perseverance. We rarely break anything in our dojo, and it is not a requirement for anything. My sensei does have some of those color coded boarda, and they are fun to play with. Dan does have a point. I once watched a cub scout den leader teach a bunch of kids to break at a campout. They were breaking boards for hours after that. I'm re-living my breaking nightmare. I guess Chuck Norris and I have something in common! Oh, the awful memories though. I once watched a cub scout den leader teach a bunch of kids to break at a campout. They were breaking boards for hours after that. I remember your breaking tales. And if I remember right, your daughter was required to break for belt promotion. I break boards in Kyokushin with almost a non-chalant attitude, and yet with an intense desire to see those things go Down! It's really a wonderful sensation of power to feel them crack in half when you achieve the right stuff. It hurts to feel your impact come flying back at you when you don't have your act together. I prefer to have the boards go "Crunch" rather than feel the negative effects in the other direction. I've had both experiences, and I definitely enjoy watching the boards break. I prefer to have the boards go "Crunch" rather than feel the negative effects in the other direction. I can imagine. Most of the karate people that I've known have never broken anything (at least deliberately). It seems the Korean styles go for the breaks more than in karate. I've broken pine, wood that I think was made for demonstrations (thin, made of strips of wood put together, easy to get a clean break on), and concrete roofing tiles. I've also broken the re-breakable tiles and re-breakable bricks. I find the re-breakables MUCH, MUCH harder to break. You'd think this wouldn't be the case, but you've got to be head on the seam to get them to break, whereas you can smack wood or concrete darn near anywhere and it will break. We broke for every belt test in America (yes, even the very first test as a white belt). Here we only have to break for dan tests, and not even first dan. Second or third? That seems to be the consensus here. To tell you the truth, I've never tried the re-breakables and I am surprised. Thanks for the info, Amanda. I've broken only one rebreakable (at Becky's dojo), and it was noticeably more difficult than the pine boards. One thing I've noticed with the TKD people (at our dojo here, no generality intended), is that pretty much all of their breaks are for kicks. When they want a hand break for a demo, they call on us. Actually I've become the go-to girl for straight punch breaks. With the fairly amusing result that after my first succesful punch through two boards, none of the TKD people will get within arm's reach of me in a fight. This story reminds me of one of the first breaking demonstrations I did as an Ik-kyu. I hit that board and broke it. Then the knuckle adjacent to the index knuckle started to swell up a little. I hit the brick - real brick that is not made for hand breaking - instead of the wooden pine. It hurt a great lot and I did not break the brick. While getting my patio up to date, I tried a lot of planks. Much harder to do. Still easy. I have yet to try breaking them on my forearms. Funny thing is since I broke my hand in last november, it has gotten quite weak on breaking. So I have to toughen it a bit. Next september :D.